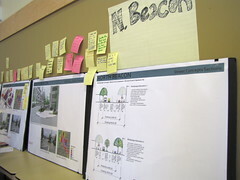 Neighbors posted comments on zoning and street configurations at the Neighborhood Plan update open house last September. Photo by Wendi. On Tuesday, February 10, the Hearing Examiner’s Office conducted a prehearing conference regarding the appeal filed by Frederica Merrell to vacate the Determination of Non-Significance (DNS) for the North Beacon Hill Neighborhood Plan update. There was also a prehearing conference for the appeal against the Othello update. The North Rainier (a.k.a. Mount Baker) appeal will be heard by the Hearing Examiner on February 16. These meetings are the first of many steps to examine the merits of the identical appeals filed by separate individuals against the Neighborhood Plan updates. These meetings are costing City of Seattle taxpayers money and taking staff time away from other DPD business. They are also delaying any progress on the work plans associated with the Neighborhood Plan Updates and halting any development and/or design plans for the sites involved. El Centro de La Raza has lost $75,000 in funds offered to help them begin preliminary community outreach to discuss design and development ideas for their property. They cannot begin to move forward on developing their site until there is some indication that zoning issues will be resolved. El Centro is a valuable community partner. They would like to develop their property in the best interests of the neighborhood. They cannot begin the conversation about how to do that until the zoning issues are resolved. Let’s be very clear: the Neighborhood Plan Updates are totally, completely about zoning. The entire point of the Neighborhood Plan Updates—the only reason they were ever developed—was to discuss zoning in the specific areas around the light rail stations. They were not intended to be and will never be replacements for the extensive Neighborhood Plans our communities have in place. All other issues are red herrings. Concurrency is a completely unrelated issue to the upzone conversation—apples and oranges. The Neighborhood Plan validation process is also completely unrelated—a completely separate process. This is the core of El Centro’s counter-appeal. DPD can clearly demonstrate that these appeals are too general and many of the complaints are outside the jurisdiction of the Hearing Examiner’s office and outside the scope of the update. “El Centro de la Raza makes a motion to dismiss this appeal because Ms. Merrell appears to be raising issues related to the passage of the North Beacon Hill Plan, rather than the adequacy of the City’s environmental review. The North Beacon Hill Plan has not been adopted by the City Council yet. No changes to the Comprehensive Plan, nor to the zoning code, have yet occurred. Therefore, any issues related to the North Beacon Hill Plan itself, or related to any potential future zoning change, are not ripe for the Hearing Examiner’s review. In addition, any issues related to the Growth Management Act are not properly before the Hearing Examiner and must be dismissed. Unfortunately, it’s going to take weeks (if not months) of public employee time away from actual projects to address these appeals. These appeals are an expensive time-wasting strategy with an end goal of keeping things in limbo. Development will happen, but it’s going to take years and millions of dollars longer because a very simple zoning question—one that has received a significant amount of community feedback—is not being answered. That’s a shame. Not having reviewed the review yet, it is hard to give an opinion about whether the appeals are frivolous and simple stall tactics or not, but if it is true that nearly identical appeals were made for the other neighborhoods, I am certainly leaning that way. However, I think that the last message we want to send to our citizens is that we shouldn’t be appealing decisions that we honestly feel are incorrect because it requires additional work by city employees. Regarding El Centro, they have demonstrated in the past that their mission is more important than the concerns of the neighborhood and I don’t expect that has changed. That is to be expected I guess, but is also justification for scrutinizing the upzoning a bit more and not standing by while the city gives away the property for little value received for the neighborhood. Personally, I would be disappointed if the upzone wasn’t contingent on some requirements such as a public easement adjacent to Lander (possibly developed and maintained by Parks), above-code setbacks on 16th and 17th, etc. Thanks for the link, Chris. Hugely helpful! I don’t think I’ve seen these specific documents anywhere, and I’m glad to have a chance to read them. It would have been great to have this information circulated via the blog, the BAN list, and other neighborhood sources. If the people who wrote the appeals wanted to gather support from their neighbors, they have many ways to do that–in all three neighborhoods. I certainly encourage people to appeal what they feel isn’t right–we need vigorous examination and debate in our communities. What these three appeals claim to be about (incorrectly done SEPA reviews?) doesn’t seem related to the intent of the Updates. The way the appeals are proceeding seem to be intended to stretch the process out as long as possible. Filing an appeal isn’t wasting DPD’s time or taxpayer’s money. Its simply asking DPD to consider all the possible neighborhood opinions. DPD is for the Department of PLANNING and DEVELOPMENT. They are in the business of planning and developing – this is their job. And as such, they have to be held accountable for the decisions they make. They can’t impose the will of one group over another without consideration. Moreover, part of a democracy is vigorous and healthy debate. I welcome hearing both sides of the story. DPD spent 14 months soliciting opinions. They held some of the most diverse, accessible, culturally sensitive forums I’ve ever seen. They moved forward with a proposed update, actively soliciting more opinions. The waste of time is claiming that they didn’t. The extra waste of time is requiring them to “produce” documents that are already public record. Everything DPD does is public record, the public has spoken, and a small group doesn’t like it. The side of the story we’re not hearing is who actually wrote the three identical appeals and why those involved insist on referring to themselves as “individuals”. There’s no way three separate appeals were written independently and happened to come out word for word. Katrina, It seems to me that when the appeal is filed by a person who was very active in months of meetings, the argument that the appeal is necessary because her opinion hadn’t been considered is a weak one. If someone who hadn’t attended the meetings read the plan and saw a reason for concern, that would be different. Vigorous debate without all the messy human interaction part! Perfect!!! Adam, you’ve all but said you think I’m an Internet troll. If you want to go have a cup of coffee some weekend and put a face on my name, I’d be happy to meet you. What you do for a living and what I do for a living are related, although I’m guessing we have different perspectives on the role of digital social interactions. We could start by discussing that, then work our way up to agreeing to disagree on the Neighborhood Plan without resorting to barbed comments. Brook, Hey, don’t steal my troll thunder! I wanna be the troll! Coffee, sure. Or perhaps not. Aren’t you too busy? I’m busy too. Everyone is. I like to keep things efficient, work with the process. I like to meet my neighbors in local friendly groups and learn about what’s really going on the hill. Turns out they aren’t all godless hippie intelligensia. So I’ll take rain check on the one to one. But I’ll probably see you at the Jefferson Park Gardening meeting (my kids are avid gardeners), or the Bicycling and Walking Improvement meetings (I bike commute), or the Jeff Park skate park meetings (I like helping with park design) or at the first Thursday at the library thing (to keep me up on urban planning and politics). Folks have been known to go out for beers after the Thursday meetings at Beacon Pub. So while while were talking about me (not sure why tho) all those meeting are at most 4 to 6 hours of my time a month. Maybe if I miss one or two I can get that down to 2 or 3 hours – keep track with help from the blog here. So I miss a few episode of “Touched by an Angel,” my peace of mind is much the greater for it. Anyone care to join in? All are welcome. Even folks that think I’m writing this just to them.